Therapy Insiders Podcast is proud to be sponsored by WebPT! Have you had the deductible talk with a patient yet? Yea, chances are you have. It’s a difficult conversation to navigate. Would you like to learn how to tackle it head on and improve the persons understanding in such a way that it helps everyone? Have you had issues collecting payments from patients with high-deductibles? Obviously, there are many issues with high-deductible insurance plans. 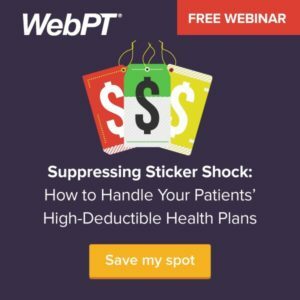 Check out this FREE webinar, Suppressing Sticker Shock by Heidi Jannenga, President of WebPT and Nancy Ham, CEO of WebPT! Heidi and Nancy address the aforementioned questions and help explain strategies to handle patients with high-deductible plans. You don’t want to miss it! Physical therapy is an ever evolving practice and for me, a personal journey. That’s why I’m committed to staying at the forefront of the industry. Through continuing education and my practice, I work to enrich myself so I can impart to others the true value of physical therapy. My mission is to show people how physical therapy can improve their lives. This is what drives me to help my clients attain their own goals and for myself to build upon the work of those who have helped lead the way. "We have an opportunity, we need to embrace it." "That was slap in the face Jackass moment." "It's about collaborative care, not silo'd care." "We can set a new normal." As president and co-founder, Heidi leads WebPT’s product vision, company culture, and branding efforts, while advocating for the physical therapy profession on a national scale. She co-founded WebPT after recognizing the need for a more sophisticated industry-specific EMR platform and has since guided the company through exponential growth, while garnering national recognition. Heidi brings with her more than 15 years of experience as a physical therapist and multi-clinic site director as well as a passion for healthcare innovation, entrepreneurship, and leadership.An active member of the sports and private practice sections of the APTA, Heidi advocates for independent rehab therapy businesses, speaks as a subject-matter expert at industry conferences and events, and participates in local and national technology, entrepreneurship, and women-in-leadership seminars. In 2014, Heidi was appointed to the PT-PAC Board of Trustees. She also serves as a mentor to physical therapy students and local entrepreneurs and leverages her platform to promote the importance of diversity, company culture, and overall business acumen for private practice rehab therapy professionals. In 2015, Heidi was named the AzPTA's Physical Therapist of the Year. "Exercise is one of the only evidence based things thats good for everything." "End of the day the clients success is the most important thing." "This isn't a massage parlor." "We are all here to help people." Have you had the deductible talk with a patient yet? Yea, chances are you have. It's a difficult conversation to navigate. Would you like to learn how to tackle it head on and improve the persons understanding in such a way that it helps everyone? Have you had issues collecting payments from patients with high-deductibles? Obviously, there are many issues with high-deductible insurance plans. Check out this FREE webinar, Suppressing Sticker Shock by Heidi Jannenga, President of WebPT and Nancy Ham, CEO of WebPT! Heidi and Nancy address the aforementioned questions and help explain strategies to handle patients with high-deductible plans. You don't want to miss it! I consider myself a lifelong student of the field. In my decade of experience, I've had the privilege of working with thousands of clients and athletes in the private sector and in the team atmosphere. It has become my personal mission to help the fields of strength and conditioning and sports rehabilitation grow as much as possible through my coaching, my voice, and my content. My ultimate goal is to consistently provide simple information that is digestible to the masses. Intelligent movement, strength, and performance should be no secret—this information should be shared through the proper avenues to help promote physical strength development in training and to help reduce the rate of injury in performance. This is what drives me. Throughout my career, I've worked with members from professional organizations in the NHL, NBA, NFL, and MLB. Additionally, I've had the pleasure of working with the general population from all walks of life, including the likes of powerlifters, Olympic weightlifters, CrossFit athletes, marathon runners, and triathletes. Working with healthy and injured athletes alike in both training and treatment, I've also been utilized regularly as a consultant with sports teams, collegiate athletic programs, and corporate companies. Most importantly, I view human connection, effective communication, and complete individualization as the most powerful coaching tools, regardless of service. I place a strong emphasis on personal growth and continued education, in order to better serve the individuals I work with. Primarily, I focus on a movement-based approach through progressive strength development and technical skill acquisition. I am a proud graduate of the University of Massachusetts Boston where I obtained my Bachelors of Science Degree in Exercise and Health Sciences, and the Cortiva Institute where I obtained my License in Manual Therapy. ​As someone who stresses the value of walking the walk alongside my athletes and clients, it's important for me to consistently work on my own physical preparation as well. My most recent athletic endeavors have taken place on the powerlifting platform with competition bests of 385 squat, 285 bench press, and 465 deadlift. My work has been published and featured in Men's Fitness, STACK, The Personal Trainer Development Center, The CrossFit Journal, Juggernaut Training Systems, UpDoc Media, Sports Rehab Expert, Boston Magazine, and Breaking Muscle. As a public speaker, I have been provided with opportunities to present at EXOS at Google Headquarters, The Micheli Center, NEHRSA, along with several Strength & Conditioning facilities and Exercise Physiology/Doctor of Physical Therapy academic programs. 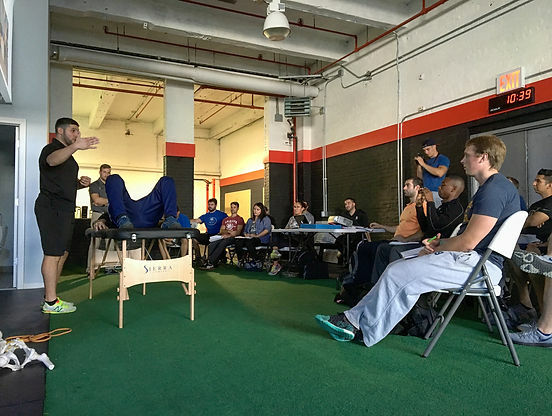 The Hip Hinge 101 Workshop, which I co-teach alongside Dr. Zak Gabor, has been presented in Massachusetts, Connecticut, New Hampshire, New York, Rhode Island, Colorado, and Vermont.